Welcome to the third episode of “Easy Pieces for Max”, small patches that produce strange and/or interesting sounds (here are the rules for these pieces). Time to make some nasty (and sometimes gentle) noise! First of all, listen to this (but don’t use headphones, I warn you!). Noisy, eh? Believe it or not, the subpatch contains only 4 audio (MSP) objects and 10 control (Max) objects. And, as you may have noticed, it doesn’t have any parameter: it goes by itself. 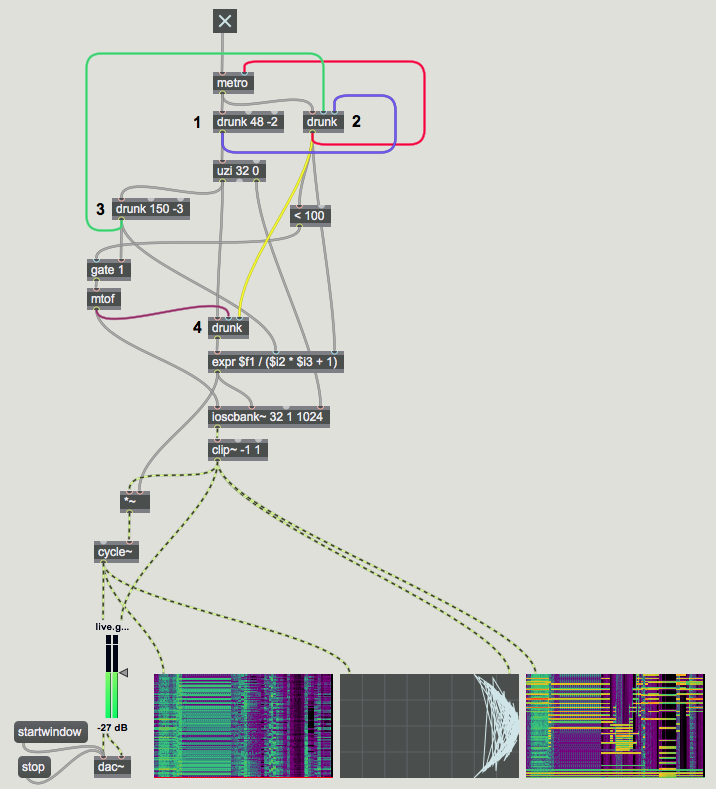 As we will shortly see, all the object are rather basic (no filters, no delays, no spectral processors…): in fact they are all described in our first volume of Electronic Music and Sound Design for Max and MSP. It is the complex interaction among the objects that creates the very peculiar sound. Probably a tad more complex than the preceding ones… let’s see how it works. The main generator is the [ioscbank~] object that contains 32 oscillators; at each bang of the [metro] object the control part generates the data for the oscillators. Moreover each [drunk] controls other parameters to create a continuously evolving sound. As you can see [drunk] #1 controls the step parameter (third inlet) of [drunk] #2, while [drunk] #3 controls the range parameter of [drunk] #2. The sound produced by [ioscbank~] is clipped and sent directly to the right channel, it is also sent (after being rescaled by the [expr] object controlled by [drunk] #4) to the phase input of a [cycle~] oscillator that is sent to the left channel. That’s all for now. As usual, you can recreate the patch yourself, or you can download it by subscribing to the Virtual Sound Newsletter (see below) to have access to the special Bonus Page reserved for subscribers only. And don’t forget to subscribe to the Virtual Sound Newsletter!